BEST RATES IN THE AREA. Do the MATH!!!!! Enchanting Beach House!! If you are looking for the perfect BEACH RETREAT, look no further! 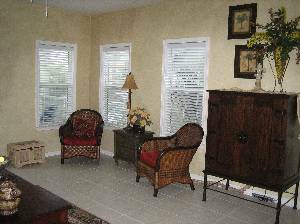 RAINEY'S RETREAT, located in the heart of Santa Rosa Beach on Scenic Hwy 30A, is a 4 bedroom, 3 bath, 2 story home, just a short stroll from the world-famous sugar white sands and emerald green waters of the Gulf of Mexico. 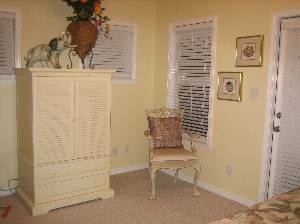 Rainey's Retreat is tastefully decorated with everything you need for your ideal beach vacation. Old Florida Village is a quaint new neighborhood of colorful homes on a quiet dead end street, ideal for biking, morning jogs or evening strolls. One of the two community pools is just a few steps away. 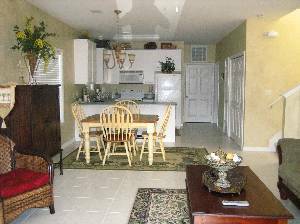 Rainey's Retreat is completely furnished with all the necessities...linens, towels, kitchen utensils, washer, dryer, etc. There are TV's with DVD or VCR in every room. 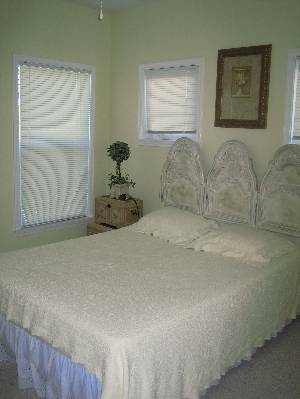 Bring your friends and family...the house sleeps 10 comfortably. The master suite on the 2nd floor features a king bed and master bath with walk-in shower and tub, and opens onto the 2nd story balcony. 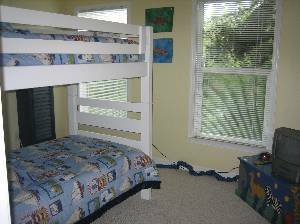 There are two additional bedrooms upstairs, one with a queen bed and the other a children's room with bunk beds. 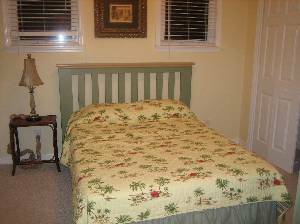 A fourth bedroom with a full bed is located on the first floor. There are two bathrooms upstairs and one bath down. 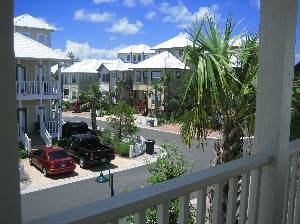 Rainey's Retreat is just a short drive to Silver Sands, the largest factory outlet mall in the country, located in the Sandestin/Destin area. Or, spend the day browsing unique shops of nearby Seaside, Grayton Beach, Rosemary Beach, and Water Color. Gulf Place, a short walk on the bike path, features outdoor events in the amphitheater as well as restaurants, shopping boutiques, artist fairs and other entertainment options. There are several fabulous restaurants minutes away from Old Florida Village. For the golfers out there...the beautiful 18-hole Santa Rosa Golf Club is less than 2 miles away. Camp Creek, Hombre, and Bay Point are just a few more of the wonderful golf courses nearby. 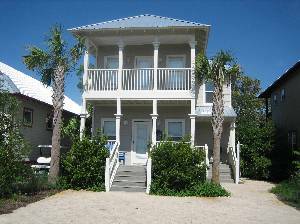 Make this ENCHANTING HOUSE part of your perfect SANTA ROSA BEACH VACATION! You'll want to return every year to RAINEY'S RETREAT and Old Florida Village. Deposit: 50% of rental fee and $40 processing fee due immediately upon reservation. Cancellations and Refunds: There will be a minimum $100 penalty that will be deducted from the rental deposit upon cancellation. If the cancellation occurs within 60 days prior to arrival, the full deposit will be retained for loss of rent. If the cancellation occurs within 30 days prior to arrival, the full rent and taxes will be retained for loss of rent. There are no refunds for early departures. Reservations made within 60 days of arrival will be guaranteed and will be charged as stated above. COMPLETE REFUND IF AREA IS UNDER EVACUATION.